The Calgary Roughnecks return to the Scotiabank Saddledome tonight for a Lax to the Max Party, presented by Tommy Gun’s Original Barbershop, against the Colorado Mammoth. Game time is 7:00 p.m. with $5 Rough House food and beverage specials beginning at 5:30 p.m. Fans are encouraged to remain in their seats for the Drill Bits Halftime Show presented by Halliburton. Calgary halted a four-game slide with last Saturday’s 16-8 road triumph against the Toronto Rock. The Riggers, who had a dominating seven-goal fourth quarter, were led by Curtis Dickson’s four goals and two helpers. Wesley Berg and Holden Cattoni each matched Dickson’s game-high six-point effort with a pair of goals and four assists. Heading into the final frame with a 9-8 advantage, the Riggers charged ahead as Dane Dobbie scored twice to increase the lead and complete his hat-trick. Goaltender Christian Del Bianco was fantastic in his first start of the season. He made 47 saves on 55 shots to earn his first career NLL win, ending Toronto’s four-game win success. The Mammoth were last in action on Feb. 2 when the West Division-leading Saskatchewan Rush earned a 13-10 road victory in Denver. VS. COLORADO: Tonight marks the second of three regular season meetings between the two West Division rivals. 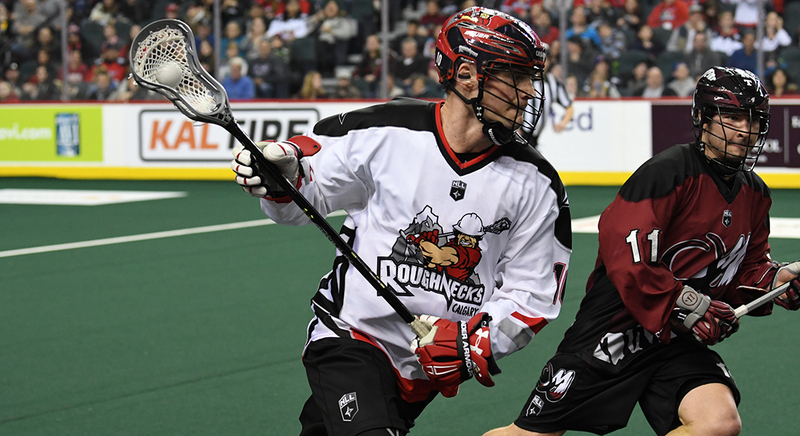 Last season the Roughnecks held the advantage in the series, picking up two of three wins. Meanwhile, Colorado edged Calgary by a combined score of 38-35 in the three matches. Calgary is 1-3 when playing at the ’Dome this season while Colorado is 2-0 on the road. The teams will close out their regular season series on Saturday, Mar. 10, at Pepsi Center in Denver. Dec. 29/17 at CGY: COL 11 CGY 7 … The match-up entered the halftime break with the clubs knotted at four apiece. A scoreless third quarter proved too much for the Roughnecks to overcome. The visiting Mammoth pressed in the second half, adding seven goals while holding Calgary to three. Ryan Benesch dominated the visitors attack with five goals and three assists to finish the night with a game-high eight points. For Calgary, Wesley Berg led the team with two tallies and a pair of helpers. INSIDE THE ROAD WIN: The Roughnecks scored this season’s most fourth-quarter goals with seven … Calgary held Toronto scoreless for 17:10 including the entire fourth frame … The Riggers had a 51.9 face-off percentage as Tyler Burton won 14 of 27 draws … Zach Currier collected a game-high 14 loose balls for Calgary … Christian Del Bianco picked up with first career NLL win in his first start of the season … The Roughnecks held the Rock to a season-low eight goals. THE LAST TWO: Calgary scored a combined 28 goals against Toronto (Feb. 3) and Saskatchewan (Jan. 27) while their previous two contests (Jan. 6 & 13) saw the team net 20. The Riggers allowed 28 goals over their first two games in January and held their opponents to 21 in the last pair of outs. COACH’S CORNER: Assistant general manager and head coach Curt Malawsky has guided the Roughnecks to 46 victories, duplicating the late Chris Hall’s record. Malawsky is one win away from becoming the most winningest coach in franchise history. Hall led the Riggers to a record of 46-42 from 2002-07. SPECIAL TEAMS WATCH: Calgary’s power play is seventh in the NLL at 43.3% while the penalty kill is third in the league at 56.0%. The team has scored five shorthanded goals, ranking tied for third overall. DOMINANT DOBBIE: Alternate captain Dane Dobbie became the franchise’s all-time leading scorer on Jan. 27 against the Rush. His third-quarter assist pushed his point total to 685, eclipsing the previous mark of 684 set by now-Rush forward Jeff Shattler. Dobbie added two goals and four more assists to finish the night with a game-high seven points. Following last Saturday’s road victory in Toronto, he now has 694 career points (346g, 348a) in 150 games with Calgary. QUARTER BREAK: The Roughnecks have outscored their opposition in seven quarters this season while also tying their opponents in six. Of the 28 quarters played, five have resulted in a one-goal differential while eight saw a two-goal spread. CLIMBING THE CHARTS: Defenceman Mike Carnegie has moved into third all-time in franchise games played at 162, surpassing Kaleb Toth who retired in December 2012 with 160 games played for Calgary. Former captain Andrew McBride sits atop the games played list with 198 followed by Jeff Shattler at 183. LEADERSHIP GROUP: Defenceman/transition player Dan MacRae is wearing the ‘C’ this season. He succeeds Bruce Alexander (2002), Tracey Kelusky (2003-10), Andrew McBride (2011-15) and Mike Carnegie (2016-17) as captain. MacRae, who served as alternate captain from 2016-17, has spent his entire eight-year playing career with the Roughnecks. Defenceman Greg Harnett and forward Dane Dobbie return as alternate captains for the 2017-18 season while forward Curtis Dickson received an ‘A’ for the first time this year. Dobbie, the franchise’s all-time goals leader (346), is playing in his 11th season with Calgary. This is seven season for Harnett and for Dickson, the 2011 NLL Rookie of the Year, 2017-18 marks campaign eight with the Roughnecks. ROUGHNECKS MONTH-BY-MONTH: December (1-2), January (0-3), February (1-0). ROUGHNECKS VS.: (BUF 0-1), (COL 0-1), (GA 0-1), (NE 0-0), (ROC 0-1), (SAS 0-1), (TOR 1-0), (VAN 1-0). ROUGHNECKS VS. DIVISION: West (1-2), East (1-3).